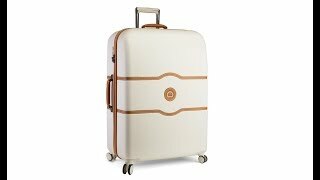 Elegant and innovative, this textured Chatelet Hard+ Carry-On by Delsey features a unique brake system that locks the front wheels when activated by the push of a button to prevent a run-away suitcase on an incline, while allowing travelers to roll the bag on the back two wheels. The Delsey Chatelet Hard+ Collection is made from 100% Virgin Polycarbonate, formulated to achieve the highest standards of extreme temperature and impact resistance. With superior maneuverability from the silent-running double spinner wheels, and a fully-lined double packing compartment with deluxe features to ultimately secure your contents from shifting during travel. what is the next size of your matching luggage to the overhead size available? PROS: Purchased the brown color. Looks very smart. Wheels are superior. Weight is very light. Interior has fantastic zipper closures. Keeps my clothing in place and organized. Very nice quality. CONS: The only feature missing is the “pop up “ expansion zipper for those trips where I’m returning home with additional items. PROS: Beautiful and functional. This thing fit so much for my trip it’s the only thing I took. My girlfriends couldn’t believe I had everything in my carryon as they had to check in the large luggage. PROS: I love how it looks, but mostly love the durability and the way it is designed to hold so many items! I also used packing cubes, so I was able to pack everything I needed for my trip without sacrificing style!! PROS: Have been waiting to buy it almost 2 years, and finally got it. Never disappointed. Love the color and design! PROS: Looks great, has many compartments including a hanger and the chance to hang clothing, rolls very smoothly. It's the most beautiful luggage I've ever owned. I haven't used it yet but I'm achin' to travel so I can put it to good use. CONS: It came locked and there was no instruction about how to open it but I called Delsey's number with that question and a few more. I talked to "actual people" (not a Voice Mail) and the people I spoke with were very helpful. PROS: Absolutely love this luggage. It is both durable and beautiful. I also recommend buying through Luggage Pros. Their prices are great, and the luggage comes meticulously wrapped and in perfect shape. PROS: Perfect for short trips when you don't want to check baggage. Easy to pull or push. Looks great. CONS: Champange color will get marked up but is very easy to clean. Good as new. PROS: This back is easy to pull, it literally glides across the airports hard and soft surfaces. CONS: Can be hard to keep clean if you have to check it. I recommend avoiding that situation at all cost. PROS: I purchased it as a graduation gift for my daughter. It is absolutely beautiful! PROS: This luggage is absolutely amazing! I am so excited to use it on my upcoming trip. I especially love all of the inner compartments that allows you to organize all of your belongings. It's sturdy on the outside, durable, yet fashionable! Plus at this price it's a must have! Compare it to the price listed on other websites its certainly a product you cannot pass up! Beautiful. Amazing. Hold enough stuff for a 5 day work trip. PROS: The two sides with zippers. Keeps everything secure and not wrinkly. PROS: If you are sitting on the fence to purchase this online trust me it is even more gorgeous in person!! No more packing the morning of a trip...this bag makes you excited to pack! CONS: A little pricey but the quality is great & worth the splurge! PROS: I love the divided sections, hanger feature, individual pockets, durable outer shell, and built-in TSA lock. This brand is well worth it's price! CONS: None, loved everything about it!